Getting enough protein in your diet is essential when trying to build muscle, and protein powders can help you meet your needs. Whey protein is considered fast-acting and easily absorbed. You can choose either whey protein concentrate or whey protein isolate, with the latter being a slightly better source of protein. Wheybolic is a protein powder made by GNC that contains whey protein isolate. Whey is one of the two proteins found in milk. When whey is separated from the other components of milk, some of the fat and carbohydrate remain. The whey powder undergoes a filtration process that helps concentrate the protein to limit the amount of fat and carbs in the product, creating the whey protein concentrate. Whey protein isolate is processed even further to filter out most of the fat and carbs to create an almost pure protein product. A 39-gram scoop of whey protein powder with whey protein concenctrate, which is approximately 1/3 cup, contains 26 grams of protein. The same serving of Wheybolic contains 20 grams of protein. The National Strength and Conditioning Association says you don't need more than 0.6 to 0.9 gram of protein per pound of body weight a day, which translates into 105 to 158 grams of protein for a 175-pound person, and a healthy diet with an additional 25 grams of protein from a supplement should more than adequately meet those needs. It's important to note that the recommended serving for Wheybolic is three scoops or 79 grams, which translates to 60 grams of protein. Wheybolic is lower in carbohydrates and fat, as well as calories, than a whey protein powder. A scoop serving of Wheybolic has 93 calories, 2 grams of carbohydrates and less than 0.5 gram of fat, versus 150 calories, 7 grams of carbohydrate and 2 grams of fat in a whey protein powder. The directions for Wheybolic suggest that you take the supplement 30 minutes after you work out. In addition to protein, however, your post-workout meal should include carbohydrates and fat to promote repletion of energy stores while sparing the protein for muscle repair and growth. 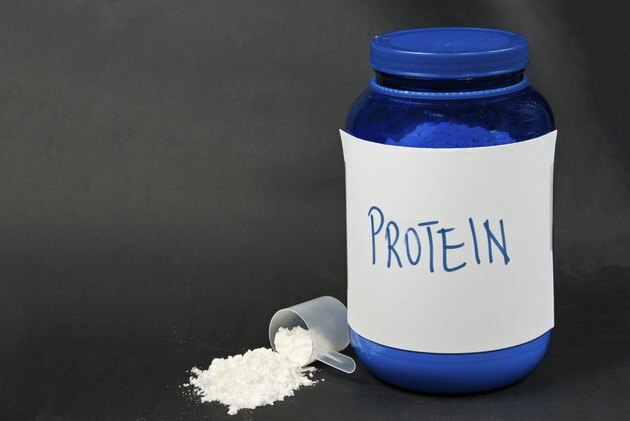 If you're taking the protein powder as suggested, after your workout, you'll need to mix the powder with a source of carbohydrates and fat to get the most benefit. For example, you can blend your scoop of Wheybolic with a banana, almond milk, almond butter and ice to get a mix of all the necessary nutrients. You may be able to simply mix a whey protein powder in a glass of low-fat milk or a plant-milk alternative to get the nutrients you need and provide a slightly better source of carbohydrates and fat. What Are the Side Effects of MuscleTech Protein Drinks?